If you are looking for a way to stay in touch with your hunting buddies, friends and family while you are out in the field, you need a set of hunting two-way radios. With hunting 2-way radios, you can team up to track prey, receive important weather alerts, and stay safe in the wild. While 2-way radios will never give you the clarity of a cell phone, they do give you reception in areas where you may not be able to get a cell signal. They also include features designed especially for hunters. Need help choosing a set of hunting 2-way radios? Check the comparison table below to review prices and features for popular products on Amazon.com. 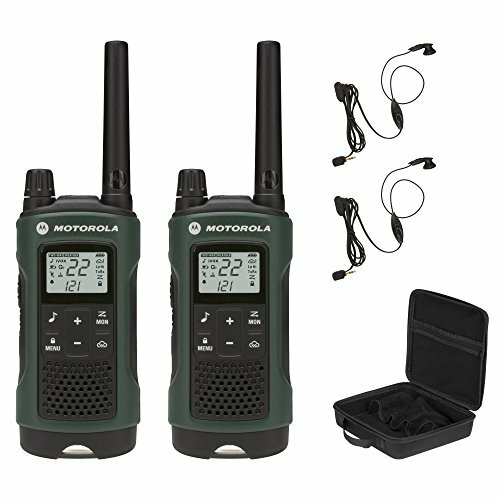 Still not ready to pick out a set of hunting walkie talkies? Read on to learn everything you need to know to make the right purchase decision. What is a Hunting Two-Way Radio? Hunting 2-way radios are just like standard walkie talkies, except that they include features which are aimed specifically at hunters. They may for example come in camo colors and include silent operation features. We will share these features with you in-depth below. But first, let’s look at some questions you should ask yourself when shopping for a two-way hunting radio set. Where will you use the 2-way hunting radios? This is an important consideration when evaluating range. If you will be hunting in dense woods, you will get a shorter effective range than you would hunting on the plains. Look for a long antenna and other range-boosting features if you will be in densely wooded areas. How long are your hunting trips? If you routinely go out for days at a time, you may want to shop for radios with extra-long battery life. Also check which types of batteries are compatible. Some hunting radios include a lot of extra features like LED flashlights or even animal call alerts. Features like these will add to the price, but also to the value. Some extra features may drain your batteries, but in most cases you can deactivate them when they are not needed, so this is a minor consideration. While many radios advertise that they can get “up to 35” miles or more in reception, that is only the case in completely flat unobstructed locations. Your realistic range will be closer to three miles in most locations. It can be difficult getting good reception in dense woods, and manufacturers know this. This is why many hunting 2-way radios include extra features to boost range. These may include a longer antenna, adjustable wattage, and built-in repeater channels. Repeater channels can transmit through a local repeater station to boost the range of your signals. NOAA weather alerts let you know when inclement weather conditions are on the way. This is an important safety feature when you are out in the wilderness. Many hunting 2-way radios are camouflaged so that they blend in with your surroundings alongside the rest of your camo gear. This is not an absolutely essential feature, but it can be nice to have. Of course, just keep in mind that if you should happen to drop your hunting radio, it may be harder to spot than one in a bright color. You are not going to want to juggle a 2-way radio while you are also attempting to sit still and shoot your prey. For this reason, you will want to make sure the radio you are purchasing is compatible with a headset of your choice. Some models even come with headsets in the box, which can cut back on the cost and hassle of getting set up. While hunting, your radio is probably going to be exposed to dust, dirt, mud, and rain. Look for a sturdy model which is going to hold up to rough handling and which will not be damaged the first time you drop it in a puddle. Some two-way radios are even fully submersible. This could be very important if you do a lot of your hunting in marshes or areas with lakes or rivers. The last thing you want when you have the perfect shot lined up is for your hunting 2-way radio to beep and alert your prey to your presence. Shop for a model which features silent operation so that you do not spook your prey. While you are out hunting in the wilderness, you need to be able to remember where you are and how to get back to your vehicle. To that end, you probably carry a compass with you everywhere you go. But did you know you can also buy a two-way radio for hunting which includes a digital compass? Some hunting 2-way radios also incorporate GPS, which can provide you with data on your exact location, accurate to within a few feet. This is a handy feature for a couple of reasons. First of all, it does help you to stay safe since you can never get lost. Secondly, it can help you to note locations to come back to where the hunting has been particularly excellent. Some hunting 2-way radios include a special feature which allows you to customize the ring tone. Instead of a standard ring tone, you can instead choose from one of several animal calls, such as a cougar, turkey or duck. Now you know the features which are most important to shop for in a hunting 2-way radio. Think about where you will hunt, how long your trips will be, and what range you will need. Then scroll back up to the top of this page to take a closer look at our comparison chart. There you can check out the prices and features of top-selling, highly rated 2-way radios for hunters on Amazon.com! The GXT1050VP4 allows you to send out alerts in the form of animal calls. It also comes in camouflage, allowing you to stay hidden once you find the perfect bush to stalk your prey. SOS siren. If something goes wrong and you need help in the woods, just press the SOS button to send out a warning to everyone listening in. Multiple channels. If you don’t want to disturb your other hunting buddies, you can easily set up private chat on a designated channel. Good for hunting and fishing. You can activate the Midland GXT1050VP4 without having to physically press a button, freeing up your hands when you need them to hold a fishing rod or a gun. Comes with a high quality headset. Some 2-way radios come with cheapo headsets, but the GXT1050VP4 ships with a nice quality one. Outstanding value. Considering all the accessories that ship with the GXT1050VP4, the price is actually quite low for what you get. 3 year warranty. If anything goes wrong with the walkie talkie itself, you can ship it back to Midland and get a replacement one. Animal call alerts. 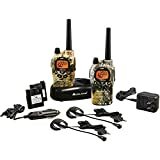 Few other walkie talkies allow you to send out animal calls to your hunting buddies. Midland customer service is top notch. However, their warranty does not cover the batteries or the stock Midland headphones that come with the GXT1050VP4. It’s not completely waterproof. Though the GXT1050VP4 resists rain and water splashes, it doesn’t last for long when fully submerged. The T465 is a well-made two-way radio that comes with a set of nice accessories and features. The built-in flashlight is quite bright and could get you out of a jam if you ever get lost in the woods at night. USB charger. You don’t need a special charger to recharge the T465, just any kind of USB port and a cable. Loud, clear speaker. On a good day you can hear the T465 clearly from about 10 feet away. You don’t have to program it. All the settings are hard-coded and cannot be changed, which is a good thing if all you want is a basic walkie talkie. Handy built-in flashlight. If you want to find your way in the dark or take a closer look at a map, the T465’s built-in flashlight will come in handy. Fits in the palm of your hand. Some two-way radios are bulky and heavy, but this one is light and easy to carry. Weatherproof. The T465 won’t give out on you if it starts to rain. Backlit display. The display allows you to communicate in the dark with ease. The T465 is nearly unbreakable. However, its plastic belt clip is quite flimsy. You can’t remove the T465’s antenna. But if you could, it probably wouldn’t be as weather resistant. The Cobra ACXT545 sports a cool looking, unbreakable rubber shell and a built-in LED flashlight. Because it has a USB port, you can use a computer to charge it. However, ACXT545’s battery life is short compared to competing two-ways. And like most walkie talkies, the ACXT545 will break if you drop it in water. USB compatible. You don’t need a special charger to fill up your batteries. Alll that’s needed is a free USB port. Built-in flashlight. The LED flashlight might come in handy in an emergency if the lights suddenly go out. Durable design. The rubber coated plastic shell resists chips and dings. Vibrating call mode. Like Motorola’s MT352R, you can set this radio to vibrate instead of ring when a call comes in. Confidential communication. 142 privacy codes prevent unauthorized listeners from hearing your conversation. Weather alerts. Like the majority of the two-way radios we looked at, this two way radio will alert you if there is an emergency weather situation in your area. 28 mile max range. The Cobra has an average range compared to other walkie talkies, but it performs pretty well in ideal conditions. These walkie talkies aren’t submersible. This JIS4 rated radio can withstand small splashes, but extended exposure to water will cause damage. Other two-way radios are more energy efficient. After less than 8 hours, the ACXT545 will require a recharge. 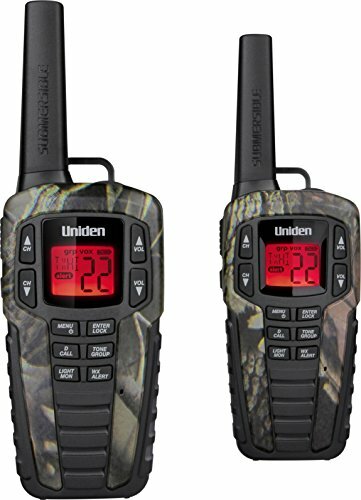 For a set of hunting walkie talkies which does it all, look into the Uniden SX377. These radios are designed to perform in a wide range of environments, and provide you with the range, alerts, and call modes you need to keep in touch and stay safe in the wilderness. Great range. Up to 37 miles of range are advertised for the Uniden SX377 two-way radio set. Real-life range is a fraction of this, but that is always going to be the case with any set of two-way radios. The effective range you do get is pretty strong, so long as you are not trying to transmit and receive through too many obstructions. Privacy for person-to-person calling. If you are connected with a group, you can still call a single person in total privacy. NOAA alerts. Be warned when inclement weather is headed your way. Lots of privacy codes. There are 22 channels with a total of 284 privacy codes available for your calls. Waterproof. 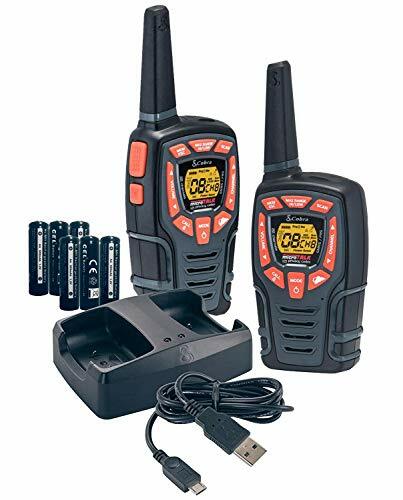 Rated submersible to JIS7 standards, these radios also float so you can retrieve them with ease. Strobe light. Need to signal visually for help? You can do so with a flashing strobe light. You can also turn off the SOS feature and simply use it as a flashlight. Since it is an LED, the bulb should last a long time. It also will not deplete the batteries too quickly. These are not the loudest radios on the market. In noisy environments, it may sometimes be hard to hear what the person on the other end is saying. The upshot is that your radios are less likely to startle your prey.